In 1204 AD, Venice agreed to help European soldiers on the Fourth Crusade. They would use their great navy to get the Crusaders to Egypt. But in exchange, the Venetians got the Crusaders to fight for them against the Roman Emperors in Constantinople, even though that had nothing to do with the Crusade. The Crusaders ended up sacking and burning Constantinople, which never recovered. 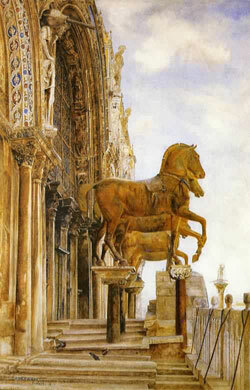 The Venetians took a lot of money and art, including some beautiful Roman bronze horses, which they put on top of their new basilica. And they split control of what was left of the Roman Empire with the Crusaders. The Venetians got richer and richer, still selling Silk Road stuff like silk and cinnamon to Europe and European stuff like wool and glass back to the Silk Road. By 1224, just as other Italian cities were beginning to make and sell paper, Venetian manufacturers organized a glassmaker’s guild. In 1300 AD, between trade and the glass industry, Venice was the richest city in Europe. But only fifty years later Venice began to go downhill. In 1348 the bubonic plague struck Venice, and tens of thousands of people died. As a result of the plague, the Mongol Empire collapsed, and trade along the Silk Road became expensive and risky. The Ottomans were not interested in trade with Europe. They didn’t let traders pass through their growing empire. 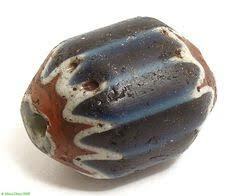 Europeans began to look for another way to get stuff from China and India. By the middle of the 1400s they had found it. The Portuguese figured out how to sail from Europe around Africa to India. Finally, when the Ottomans conquered Constantinople in 1453 AD, they also conquered a lot of Venice’s land in the eastern Mediterranean. They started trying to conquer Venice itself. Although Venice stayed independent and not poor, it was never again as important as it had been in the Middle Ages. Cite this page: Carr, K.E. Venice in the Late Middle Ages. Quatr.us Study Guides, August 3, 2017. Web. April 22, 2019.